Always grant power Attorney to a trusted aide or family member. This document can have negative consequences if the power is misused by the Attorney. Use this utility wisely. In India The Power Of Attorney Act, 1882, frameworks and guides this type of arrangement. Where the principal authorises the Attorney to do certain general acts on his behalf. The word ‘General’ here means that the power must be general regarding the subject matter and not general with regard to powers in respect of a subject matter. If you are a NRI or living abroad, refer to procedure for making GPA for NRIs and those are presently not in India. In this, principal confers powers to the Attorney to act on behalf only for specified purpose and the power ceases to exist once the purpose is over or carried out. The transaction can be single or multiple as specified. To learn more, visit Special Power of Attorney section. 1. Is the Power of Attorney authorised to sell an immovable property on behalf of the grantor? According to a ruling by the honourable Supreme court of India, sale of immovable property by a GPA is not allowed as the apex court was of the opinion it adversely affects the economy, civil society and law and order. 2. Can the Power of Attorney be cancelled ? Yes. The Power of Attorney can be cancelled by the “Revocation of Power of Attorney”. Follow the prescribed format to prepare a document in this regard. It is rather a simple format that will take minimal time to prepare and execute. 3. If I grant Power of Attorney to an agent, will my own rights to manage affairs cease? No. You have absolute right to manage your own rights even after you appoint a legal Attorney. This arrangement does does not transfer powers unilaterally to the agent. You’re only sharing it. 4. Is there any restriction on who I should choose as my Attorney? There are no limitations under the law that will restrict you from appointing a specific person as your Attorney. Be sure to choose a trusted aide or a family member as an agent. POA is a dynamic authority that can have negative repercussions as well. 5. What are the different types of Power of Attorney in India? General Power of Attorney: Used when the power of Attorney is granted by a person to his agent to act on behalf of him, generally. It can include, authorisation to operate bank accounts, register property on behalf of the principal etc. 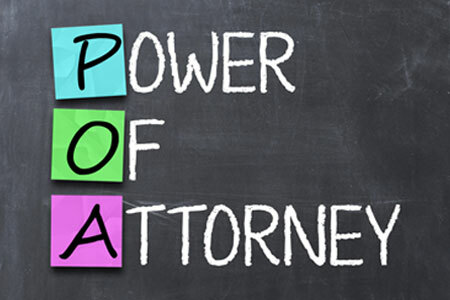 Special or Specific Power of Attorney: This type is executed when the principal wishes to grant powers to the Attorney to act on his behalf only for specific tasks/areas. 6. What happens if the grantor of POA dies while this deed is active ? All powers granted to the Attorney is naturally revoked by law. The Attorney will not be able to act on behalf of the grantor. If there was a Will in place, it will come into force.